【ALL-DAY ACTIVITIES TRACKER& FITNESS TRACKER】This smart bracelet could Monitor your daily activities including steps, distance, calories burned. 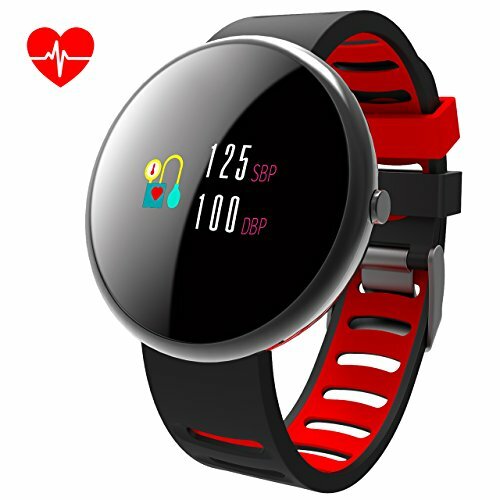 Monitor your heart rate, blood pressure and blood oxygen at any time you want. 【Phone Accessories】 Call reminder(Shows the name of who is calling), Text message push(Shows the name and content), SNS message push(Only shows name), alarm clock, camera remote control. 【EASY TO WAKE UP THE SCREEN】With just a flip of your wrist screen will turn on if the wrist sense function is on. Very easy to check the time and steps. 0.96inch large OLED Screen looks Simple and elegant. 【IP67 WATERPROOF 】Stands the water condition where you wash your hands or doing sport exercise in the rain. (NOTE: Hot water, sea water and diving are forbidden for the device, and can not be used in the shower). 【LONG-LASTING BATTERY】: Full charge requires only about 3 hours and the standby time can be up to 5-10 days with full power. The App are fully compatible with ios and android 4.4&above,IOS9.0&Above.